In our quest to help young soccer players improve, we may have started something that is more harmful than helpful. It is natural for adults to shout encouragement and advice to children as they are playing. The instinct to help is prevalent in all of us. As role models, however, we may need to take a look at some other more familiar sports and learn from them. A long fly ball heads toward left-center field. Fielders run underneath the ball. Do the coach or parents yell directions to the fielders as who, what, where and how to catch the ball? The ball handler is in the lane ready to shoot a lay-up. An opponent approaches to contest the shot. Can the coach or shooter’s parents call out any instruction that will help the player get a clear shot at the basket? Knowledgeable coaches realize that during the action of any game, one can only hope that instinct, talent and good basics will bring their players’ movements to successful fruition. These wise coaches want players to focus and concentrate on the task at hand and to tune out every extraneous sound, including calls from the sideline. These same coaches go so far as to ask their spectators to refrain from calling players by name or giving any instructions whatsoever. They even take the time to explain to the parents how difficult it is for players to concentrate on the ebb and flow of the game, listen for/to instructions, understand the instruction and apply the instruction while being pressured by an opponent. A player receiving or handling a soccer ball is in the same physical/mental state as the baseball player chasing a fly ball, the scrambling quarterback or the basketball player shooting a lay-up. 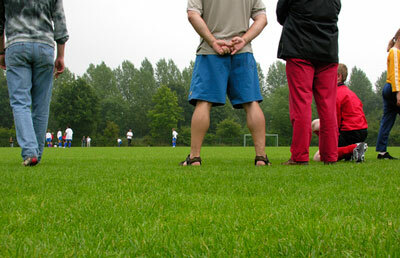 Spectators whose shoes are on or touching the soccer touchline (sidelines) are actually on the field of play. Imagine spectators in baseball on or touching the first or third base line. Professional coaches can be banned from the sidelines if they are caught coaching during the game. We have an opportunity to set a trend by having coaches adhere to the Laws of the Game—stay inside the designated coaching area, observe their team in action, take notes of points to cover during half-time and weaknesses to improve at the next practice session. We also have an opportunity to set a trend by marking out a “spectator-line” at every field to encourage spectators to observe their team in action from behind this line and cheer/applaud good play by both teams.